March, 2017: We’ve starting renovations! While we wait to hear about a federal accessibility grant for major renovations, our trusty (trustee) volunteers (Tony, Harold and Glenn) have begun some minor improvements. 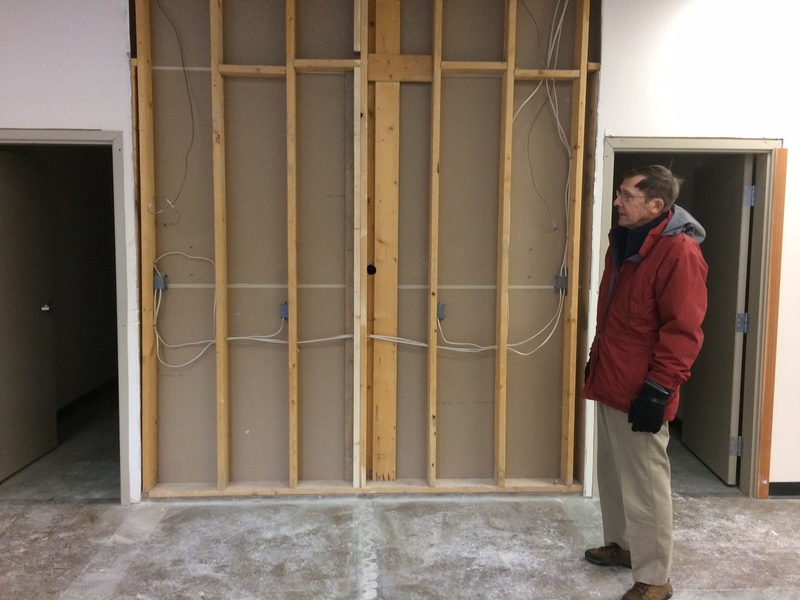 We’ve taken out the change rooms, installed the water fountain, and we’re prepping the walls for paint. Click on the photos below! 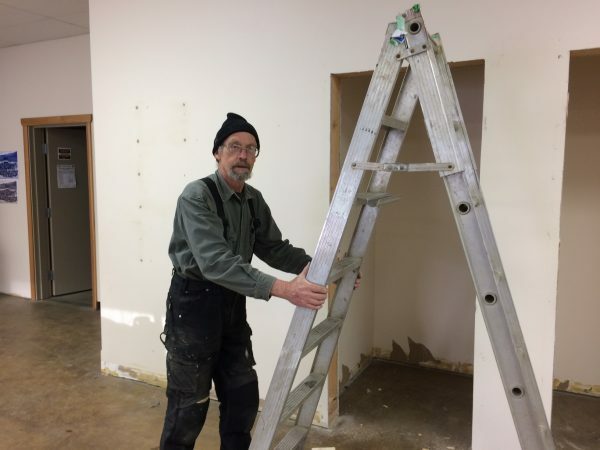 Tony is serious about ladder safety, and the job ahead. 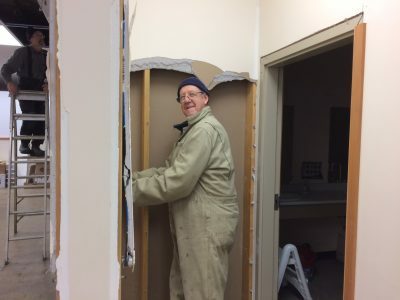 Harold is happy to be destroying drywall! Glenn considers putting the change rooms back! 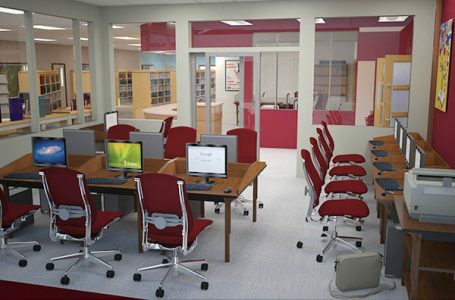 We have also been busy applying for grants to help with new furnishings. Big, big thanks to the Vanderhoof Co-op’s Community Support Fund for supplying the library with flexible tables and chairs for the new meeting room! Whether board meetings, classroom style learning, or small group activities, this furniture will serve our community well. 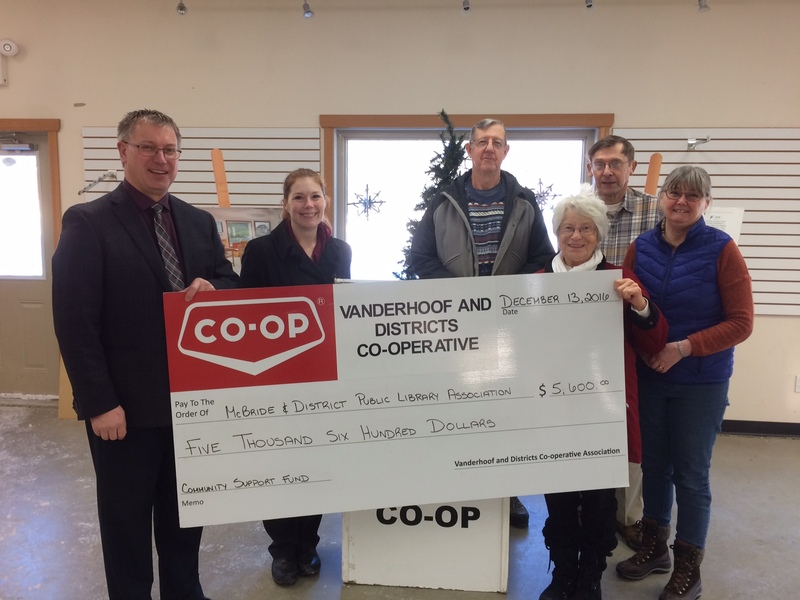 Allan and Renee from the Vanderhoof Co-op present Library Board members with a great big cheque! Huge thanks, too, to the McBride Community Foundation for funds towards an electric fireplace for our lounge space! We are excited to read, visit, catch up online, knit, or listen to music beside the fire next winter. 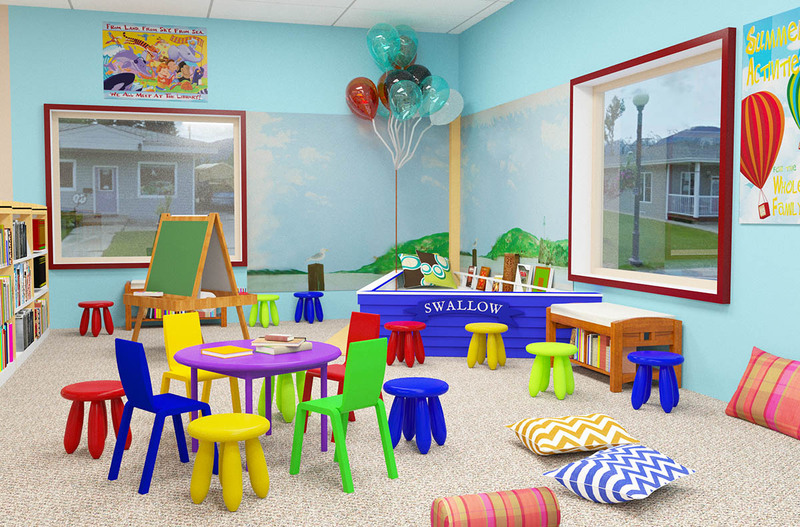 We are pleased to announce that the Regional District’s Invitation to Tender for renovations to the Robson Valley Exploration and Learning Centre at 521 Main Street is out! Tender packages are available at the Library (241 Dominion Street) during regular business hours, or via the RDFFG website at http://rdffg.bc.ca/services/financial/purchasing. 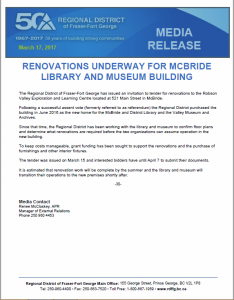 For more information, click on the Regional District’s Media Release regarding renovations. You may have noticed the large machinery working outside of 521 Main Street recently. We’ve had questions about the project’s progress and our plans to move over, and wanted to share a brief update with the community. Both the McBride & District Public Library and the Valley Museum & Archives Society are very pleased to have the grading completed before winter. This is the first step in our renovation plan, and it will mean that we are able to a) build the wheelchair ramp and accessible entrances once grant funding is confirmed and weather-pending, b) move ahead with our plan for safe storage of artifacts during renovations, and c) improve building drainage. 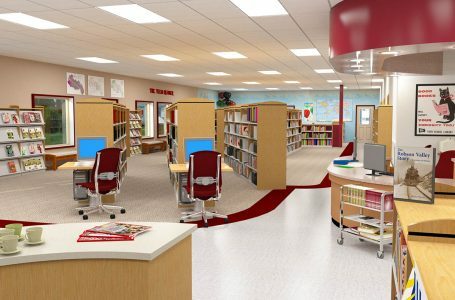 In order to keep costs manageable and the use of tax dollars minimal, we have applied for a number of grants to help fund most of the major renovation work required inside the building. We are waiting to hear about an application that the Regional District made to the Enabling Accessibility Grant Program. We are told they should know by the end of this year and until we know about that funding we can’t move ahead with renovations. In the meantime the Regional District, Library and Museum staff are busy finalizing the drawings which will form a key part of the competitive bid documents for the renovation project. Once the competitive bid is finalized, it will be posted to the Regional District website and BC Bid. 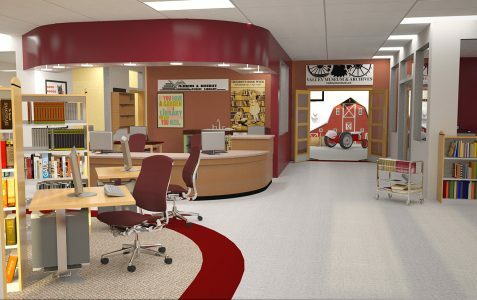 The building will be closed to community programs and events during the renovation period. Still, we are excited to be planning the new space, and we look forward to bringing the community improved programs and services within it! With the referendum we kept the cost to taxpayers as low as possible, with the understanding that we would raise funds and make improvements gradually once moved in. As a result, the Museum and Library are continuing to raise funds, both through local fundraisers like our apple pie sales, harvest supper and plant sale, as well as grant applications. This fundraising can then be used to help finance the renovations not included in the budget for the assent vote, and to help purchase equipment and furnishings. 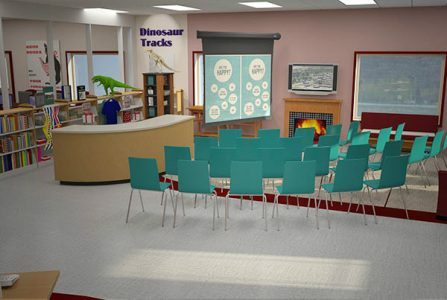 Check out our current space designs on our respective websites at mcbride.bc.libraries.coop (coming below) or valleymuseumarchives.ca. Your feedback and suggestions are most welcome in shaping future renovations! On April 30th, 2016, the question on whether to move to 521 Main was approved by residents in a referendum. Moving plans and renovations to the new building are currently underway, and by March 2017 it is expected both institutions will have fully moved in.